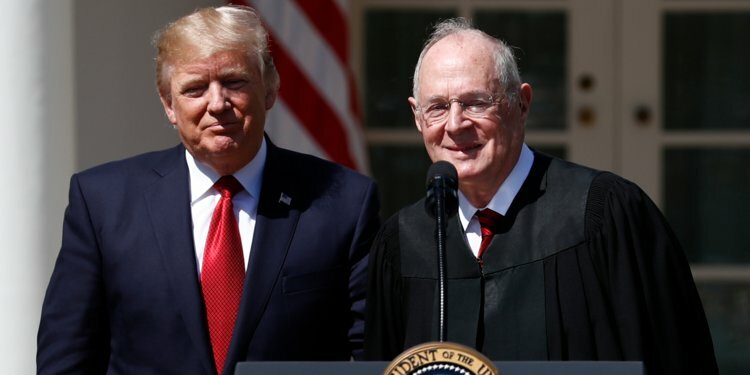 With Justice Kennedy Retiring Is It Time For Democrats to Take the Gloves Off? As you know, Justice Anthony Kennedy has announced that he will be retiring effective July 31 of this year. That means that President Trump will get to put his second Supreme Court Justice on the Court unless someone stops him. When Trump replaced the late Justice Antonin Scalia with Justice Neil Gorsuch, it hurt the left, but the Supreme Court kept its balance. One right-winger out, another one, albeit a much younger one, in. But now, with Justice Kennedy’s retirement, the balance of the Court will shift much further to the right if he is replaced by another Gorsuch-like nominee. The “swing vote” would go from the center-right Kennedy to the not-so-center Chief Justice John Roberts. If you’ll recall, the reason that we are here is because Senate Majority Leader Mitch McConnell absurdly declared that a Supreme Court nominee should not be voted on in an election year. You know the rest. And now here we are in an election year and guess who’s singing a different tune? Mitch McConnell. Crap, the thought of him singing just made us all vomit. Sorry about that. Now, Democrats in the Senate insist that the U.S. Supreme Court pick be held in abeyance until after the mid-term elections later this year. However, the Democrats are in the minority by one vote in the Senate. So if this goes by party lines, the Democrats will hem and haw and nothing will be accomplished. That leaves the Democrats with three options, one of which we deem useless from the get go, so let’s get that one out of the way. This is the option being relied upon by the Democrats and the option that has no shot of working. You think Sen. Jeff Flake really cares about this Supreme Court nominee’s impact on progressives? But Roe v. Wade is at stake, so what about the two “centrist” Republican female Senators, Sen. Lisa Murkowski and Sen. Susan Collins? If you think that either of them are going to do anything but follow orders when it comes to a Supreme Court pick, well, we have some magic beans we’d like to sell you. The Republicans long ago did away with fair play. They’ve gotten what they wanted and they’re not going to give it away now that they can move the U.S. Supreme Court further to the right than it already was. Option 1 is a no go. This is the only option that has a chance of convincing the Republicans to hold up the Supreme Court nomination or at least negotiate on it. The Democrats tell the Republicans that if they let this vote go through and confirm another Supreme Court Justice, that’s it. No more budgets being passed. No more judges. No more nothing once the Democrats win back a majority. It may not happen in 2018 but 2020 stands to be a big year for the Democrats. The Democrats need to go Liam Neeson in Taken level crazy on the Republicans. The GOP may respond with “good luck”, but if that happens, then the Democrats must follow through on the threat. None of that Obama’s red-line in Syria crap. We’re not saying it will work, but it’s the only scare tactic that has a chance. It will make the Republicans in the Senate keenly aware that if and when the Democrats take back Congress, nothing more will get done under Trump. And if the Democrats get the Oval Office? Then the gloves really come off. Of course this means that the Democrats will have to put up a united front and grow a collective spine, but stranger things have happened. Right? The Republicans have become the party of Trump. They sit idly by while our President makes a mockery of the office. They remain silent despite the racism, sexism, and hateful rhetoric toward the disabled. The Republicans once had a set of values. You may have disagreed with those values, but they stuck by them. Those days are long gone. Option 2, above, means sinking down to and even below the Republicans’ level when it comes to obstruction in Congress. It means blowing up any sense of camaraderie or unity in our nation’s greatest governing bodies. Instead, the Democrats can send a message that Michelle Obama once famously relayed: “They go low. We go high.” Democrats can tell the Republicans that we’re here to negotiate and go back to business as it should be conducted whenever you’re ready. The Democrats can then continue to run on the position of being the only party with the moral high ground. This option will do nothing in the short term; however, when Trump’s eventually out of office (get on your horse Mueller! ), Republicans may remember this moment and a few may even decide to work with their Democratic counterparts. It’s a long shot, but it does have the benefit of keeping the moral high ground that the right-wing ceded when it became the party of Trump. So there you have it. Those are the Democrats’ options. Which would we advise? Probably Option 3. Why? Because we don’t have enough faith in unity on the left or a collective spine being grown in the Democratic wing of Congress. So let’s at least play nice so that when we come back into power, we have a partner on the other side. But don’t do this middle ground nonsense. It won’t work. If you’re going to play hardball, then do it right. Take your gloves off and be ready to go to war, politically that is. This entry was posted in Opinion, Politics and tagged Anthony Kennedy, Antonin Scalia, Barack Obama, Donald Trump, Jeff Flake, John Roberts, Liam Neeson, Lisa Murkowski, Michelle Obama, Mitch McConnell, Neil Gorsuch, Obamacare, Roe v. Wade, Supreme Court, Susan Collins, Taken, Tea Party, Wells Fargo. Bookmark the permalink.